Sometimes, people focus too much on which Hogwarts House is the best. Gryffindor and Slytherin spend too much time embroiled in their deeprooted rivalry, while Hufflepuff and Ravenclaw just scramble along the sidelines shrugging their shoulders. Why, Draco Malfoy and Harry Potter nearly ended up physically harming each over some petty school rivalry. That seems like rather unhealthy behavior for a school that's supposed to be raising some of finest witches and wizards in the world. What they truly need is a symbol of unity in their school. 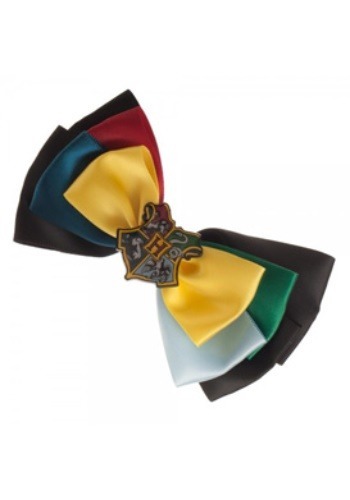 Enter this officially licensed Harry Potter Hogwarts bow. It's a simple hair bow that fits into your hair with an alligator clip, but it features style from all 4 houses on it. It features the yellow of Hufflepuff in front, but it also has the dark blue of Ravenclaw behind it. Next to that is the scarlet color of Gryffindor. On the other side is the green of Slytherin with a white-silver color on the bottom. In the center rests a Hogwarts emblem, featuring all 4 of the houses. It truly is a unifying hair bow! Just place this Harry Potter Hogwarts bow in your hair to promote unity amongst the Hogwarts Houses!